Millions of children globally suffer as a consequence of the use of intoxicating substances like alcohol and illicit drugs. This is an important, but too often neglected, child rights issue. The new FORUT publication “Childhood matters” describes this problem and suggests action to be taken to protect children’s health and well-being. Harm to others, i.e. harm to people around the users of alcohol or drugs, is a well-known but often forgotten side of the alcohol and drug problem. This is the case all over the world, in western countries as well as in developing societies. Because the use of alcohol or drugs is so wide-spread among adults, and in particular among men, in many cultures, many innocent children suffer. They experience a broad range of harm, including physical and sexual abuse, neglect, unpredictable and unprovoked incidents of violence, threats and verbal abuse. 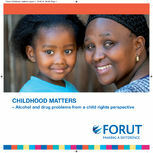 Take a look at the booklet “Childhood matters” here. A pdf version of the booklet (printer friendly) can be donwloaded here. Intoxicated behaviours by adults lead to a lack of feeling of security and trust in children. Many children develop a kind of “co-dependence” with the family member who suffers from alcohol or drug dependence in the sense that the children’s lives are just as much dominated by the substance use as is the user’s life. Unless addressed therapeutically, the consequences often last into adulthood. Another aspect of this problem is the use of intoxicating substances by children themselves, be it among marginalized groups as street children or among the general child population in some cultures where drinking of alcohol starts as early as at 10-12 years of age. Listen to childrens' voices, also in issues related to alcohol and drug use! The picture shows girls in Nepal raising their hands and their voices to end violence against girls and women. The potential negative consequences of substance use by young people are very real, very serious and well documented. The effects of such use are more powerful for younger people than for adults. Essentially, youth’s and children’s bodies and brains are still developing during the adolescent years and their personalities and life skills continue to be formed. Those important processes can be influenced highly negatively by alcohol and drug use. Furthermore, children around the world lose important opportunities and basic rights when family incomes disappear in bars and shebeens and when parents and other relatives behave irresponsibly under the influence of alcohol or drugs.